Here we are at Sunday again and I am so happy to be part of #SundaySupper. What a great group of people, so supportive of one another. I love it!! I was excited to see apples as one of the events. One of our favorite fruits, we always have apples in our fruit bowl. Granny Smiths and Galas are our pick! The apple is a very versatile fruit which can be made into so many different dishes from savory to sweet. I chose an apple crisp that I have made a hundred times. I love this and it is perfect for autumn which is my favorite time of year. From now until New Year’s it is all fun, fun, fun!! I bumped up the crisp this time with a gorgeous rich and dark caramel sauce and a r creamy vanilla ice cream. The perfect dessert to warm your insides when the outdoors are getting cooler. I hope you enjoy this recipe, it has already been shared many times!! A crisp to warm your heart this Autumn. Preheat the oven to 350F. To make the crisp place the apple slices in a buttered 9-10" pie plate. Mix brown sugar, flour, oats and cinnamon together. Cut in the butter until crumbly. Lightly press over the apples. Bake for 45-50 min. until lightly browned. To make the sauce, melt the butter in a saucepan and stir in the brown sugar until incorporated. Slowly stir in the cream. Bring the sauce up to a boil and let boil for 3 min. stirring constantly. Remove from heat and stir in the vanilla. Let cool. Pour into a jar and store in the refrigerator until ready to serve. Serve the crisp warm or at room temperature with the warmed caramel sauce and vanilla ice cream. Here’s our Autumn Apple Party Menu for Sunday Supper! Stop by our #SundaySupper Contributor’s websites for great apple ideas! Please be sure you join us on Twitter throughout the day during #SundaySupper. We’ll be meeting up at 7:00 pm (Eastern) for our weekly #SundaySupper live chat where we’ll talk about our favorite apple recipes! All you have to do is follow the #SundaySupper hashtag, or you can follow us through TweetChat! We’d also love to feature your apple recipes on our #SundaySupper Pinterest board and share them with all of our followers! Apples, caramel and vanilla, yep sounds like the perfect dessert to me. The simple pleasure of a good apple crisp. And then you top it with a caramel sauce – divine! Apple crisp is the first recipe my grandmother taught me. It´s such a comforting, easy and incredibly delicious dessert! Lovely Tara. Have a nice sunday! That caramel sauce looks dangerous! Beautiful!! Man I want some dessert for breaky 🙂 saving this one for sure. I love apples!!! Love that you even made your own caramel sauce for this! A firm family favorite here but never made them with caramel sauce before.Have to try your recipe soon :)looks delish! I haven’t made this in years! Thanks for reminding me about it I’m trying your recipe! Mmmm, this is one delicious dessert. A real show stopper. Happy #SS! Pinned. I’m all over any dessert that has caramel sauce added to it! Worth every decadent calorie! Apple crisps is one of my favorite desserts. I want it now instead of dinner! Is that bad? Thanks for sharing! You really can’t go wrong with a classic! This looks delightful! Oh goodness, I just want to scoop up that melted ice cream and lick it off my finger! This looks fantastic! I love apple crisps, this looks fantastic! Completely, positively love this. Nothing quite like a great apple crisp. So classic and so delicious. Love your photo of the end result. Oh my….this recipe is so tempting…….how can I resist when warmed caramel sauce meet with vanilla ice cream?! Yum…. I haven’t had apple crisp in years! Looks like I need to correct that and soon! That caramel sauce sounds amazing! I love that addition to the tradional apple crisp!! Can’t wait to try this recipe out! That looks like the most heavenly dessert! Great dish and great photo! Crisp on a whole other level! Delicious! Apple crisp with vanilla ice cream is one of my favorite desserts. But adding caramel sauce pushes it to the very top of my list…beautifully done!!! Lovely ! I could have some now !!!!! Oh my word! I want to lick my screen. I love apple crisp and now this one has caramel sauce on it? WOW! Oooooh…I’m literally drooling. The thought of the rich caramel sauce mingled with the sweet, soft apples, the crispy crumble topping and the cold creamy ice cream is making my stomach growl (and I just finished eating dinner!). I haven’t had an apple crisp in years. I can just imagine how good it tastes with caramel and vanilla ice cream. I would love to make this recipe on a hot cast iron skillet if I had one. Doesn’t that sound amazing? But since I don’t have one, I’ll just try your recipe. It looks divine. And I don’t use that word often. Thanks to everyone that has come by to leave a comment. WOW, there are lots here!! So glad you liked the apple crisp!!! 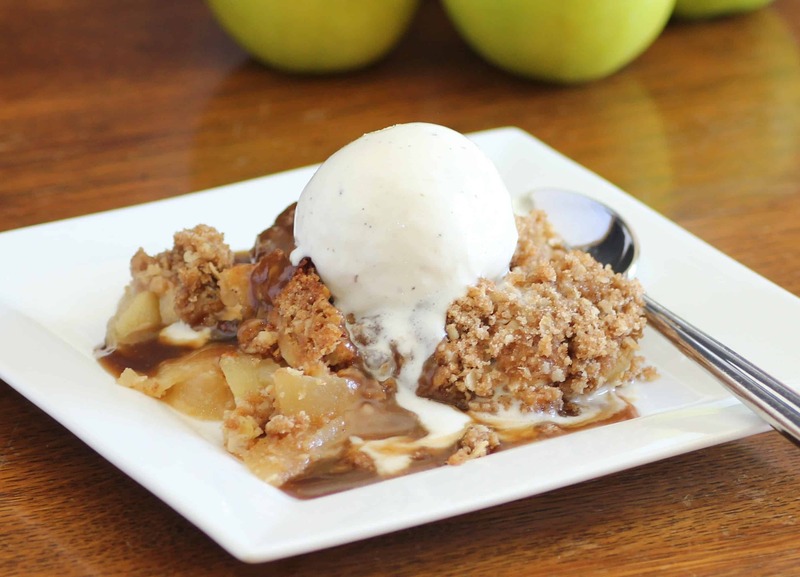 I love the pairing of apples with caramel…especially when vanilla ice cream is involved. Looks delicious! Can never go wrong with a classical dessert and pairing of apples and caramel! Beautiful photos! Apples and caramels are the best combination! Made this yumminess tonight! My kids helped me make it, and we all enjoyed eating it. Delish! We have all loved that for years. I am so glad you made it. Thanks for taking the time to comment. I so appreciate it!! Yum! I love apple crisp and this is mouth watering! Perfect for mouth watering Mondays! Thanks so much Jennifer. I love a good crisp anytime! !